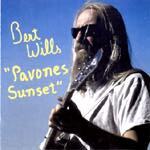 Texas blues guitarist Bert Wills recorded soundtrack music for the surf video Style Masters, which appears here. There's blues and jazz and funk, and some surfable tracks as well. The playing is very good. Shimmering slow surf silk, with exotic bongos and island whammy. Sleepy afternoon lagoons, floating mai tai trays, saronged wahines, and gentle offshore breezes. This is a very pretty piece, the sort of thing that the Blue Hawaiians might do if they took their tongue out of their cheek. Gorgeous, with swaying palm splendor. Surfy low-note twang, and a nifty riff. It really satisfies the twango urge. It sports a few pick slides and an up glissando in the opening. It carries you through without a hitch. Tasty and well delivered. "50/50" is a funky sorta number with equal parts of Texas surf and blues twango. Warm sun, engaging whammy, and crystalline evening beach scenes. Quite nice. The vibrato shimmer in the break is very nice indeed. Excellent percussion and a Duane Eddy guitar tone open "Duo-Glide," before it breaks into a basic guitar boogie. The twang's the thang! Playful, and maybe a little Freddie King to boot. Suave lounge jazz, with organ and a walking bass. It's smooth alright, even nice, but lacks the creative flair of Chris Shahin's surf jazz. Another Freddie King inspired number. It shimmers with Duane Eddy-ish almost surf tones. A little Jimmy Reed in the chord progression, and you get the sound. A variation on Barrett Strong's "Money" riff, and some very nice twang in the break. The breaks should become a song, and drop the "Money" thing, or use it for the break. "Shimmy Shimmy Coco Bop" and some saucy blues arranging. Too derivative for me. This is a very cool surf number, shimmering with vibrato and a nifty riff. It's warm and friendly without being weak or slushy. Excellent island tones and aquatic feel. Almost Jamaican in the middle, it rings with surf tones and slippery fluid notes. A basic funky number, like the seventies in the big city waiting for a bus. It's groovy enough, but leaves much to be desired from a surf point of view.